Fraggle Skunk Auto is the result of crossing a Super Skunk selected back in 1999 with a Lowryder. This is a 7th generation stable crossing, an easy to grow, autoflowering and feminized strain for the enjoyment of all cannabis community. For best results, it is recommended using a single pot for the entire life cycle of the plant, from seedling to harvest. 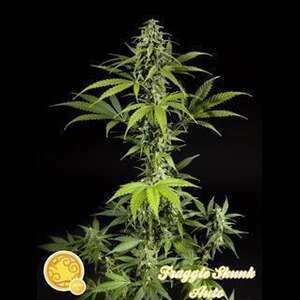 Fraggle Skunk Auto grows slender and branched, with high resistance to pests and diseases. In outdoor crops, Fraggle Sunk Auto shows a fast and vigorous development; its size is above the average ruderalis hybrids. It can easily exceed 120 cm in height, which means a beautiful flower production that will be ready to harvest 70-90 days after germination. It is perfect strain for off-season growing. Fraggle Skunk Auto offers a very special and long lasting bouquet, sweet and fruity, that will remain in your palate for a long time. Its effect perfectly combines a state of relaxation that also invites to socializing. Because of its THC/CBD cannabinoid ratio it can be used for therapeutic treatments.